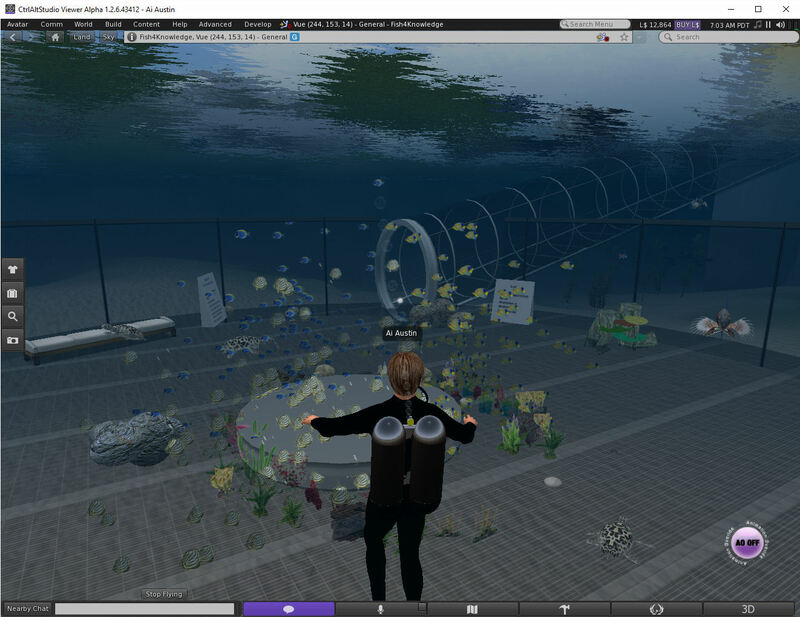 CtrlAltStudio is a version of the virtual worlds viewer for Second Life and OpenSim created by David Rowe. 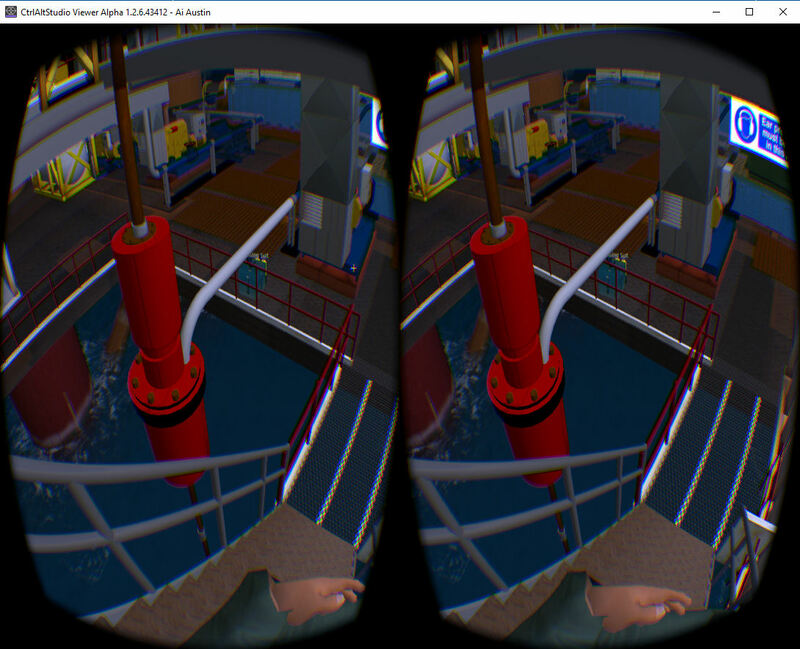 It has been updated to CtrlAltStudio 1.2.6.43412 [Codeplex Archive] to run with the Oculus Rift CV1 (as well as the previously supported DK2) under Oculus Runtime/SDK 1.5.0 (and also tested with 1.6.0). 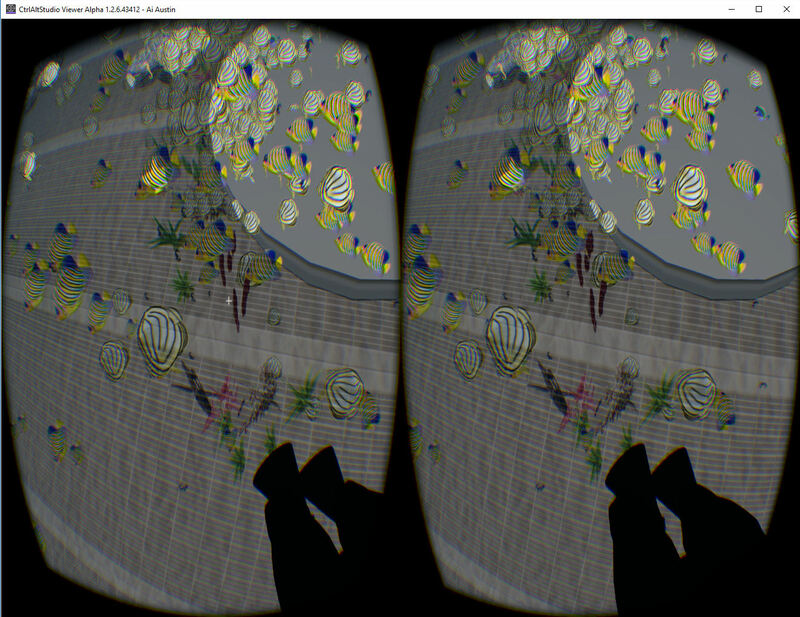 It does not work with the Oculus DK1 as that is not supported by recent Oculus Runtime/SDK code. David Rowe also notes… the viewer is not optimized for VR — the FPS is not really high or consistent enough for “proper” VR. 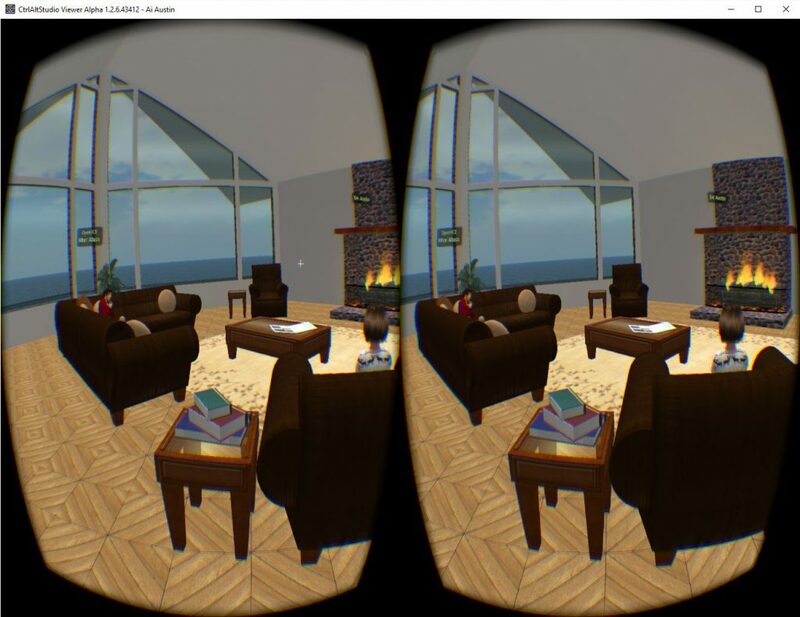 Some people are more sensitive to such rendering issues than others; however, it does let you get a taste for what user-created VW’s like Second Life can be like in VR. 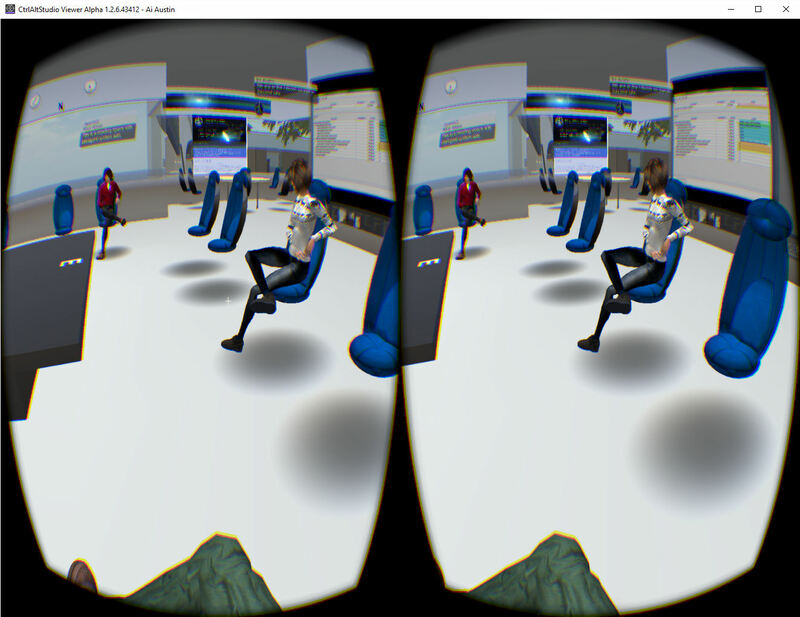 The interior of the Vue I-Room above also shows avatar text chat using overhead speech bubbles which is useful when in the Riftlook/3D view. If you have a new, high performance graphics card but Preferences > Graphics features such as “Basic shaders” are disabled this means that your graphics card isn’t recognized by the viewer (which uses a “GPU Table” to get its graphics settings); tick the “Enable all features” setting to enable the missing settings. If you wish to use an X-Box controller and have not already done this before, enable this in Preferences > Move & View > Movement > Joystick Configuration. 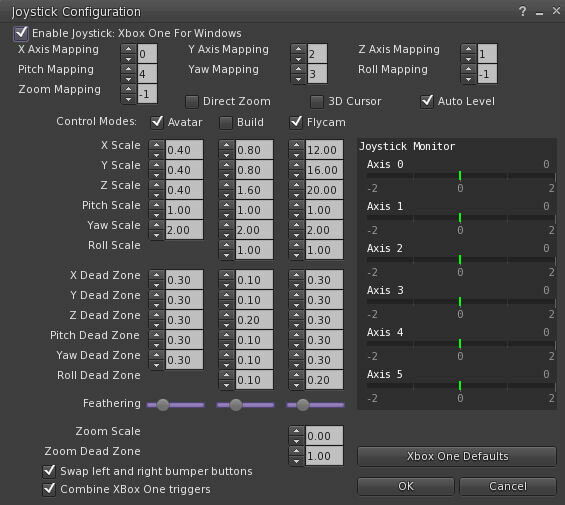 A “Combine Xbox One triggers” joystick setting lets the left and right trigger values of the Xbox One controller be used to fly up and down the same as you can use them with an Xbox 360 controller. You might find the default settings for the X-Box controller are a bit sensitive. Look at the suggestions near the end of this Blog Post (adjusted settings shown in the image to the right, click for larger version). To “zero” your orientation to your current avatar positional tracking location and recentre the mouse cursor in the field of view press Ctrl+Spacebar. 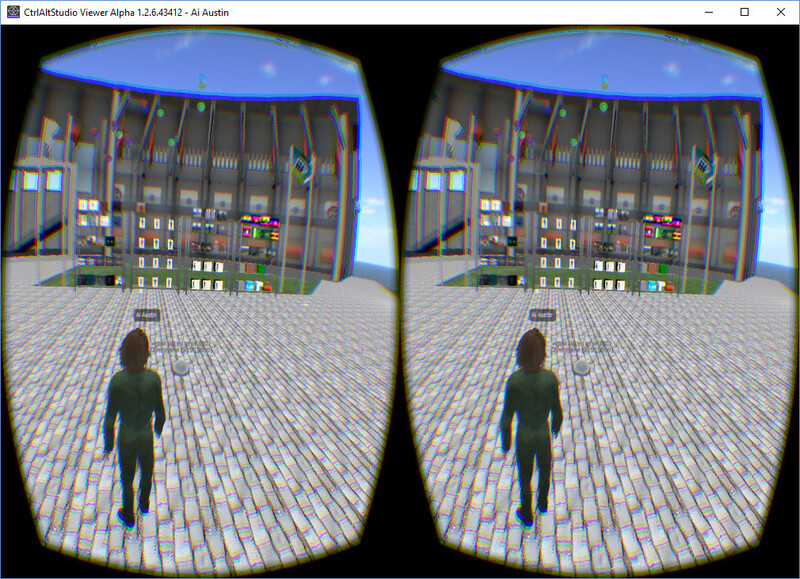 To exit Riftlook/3D view and restore the normal 2D monitor view use the “Toggle 3D” button (or Ctrl-Alt-3). 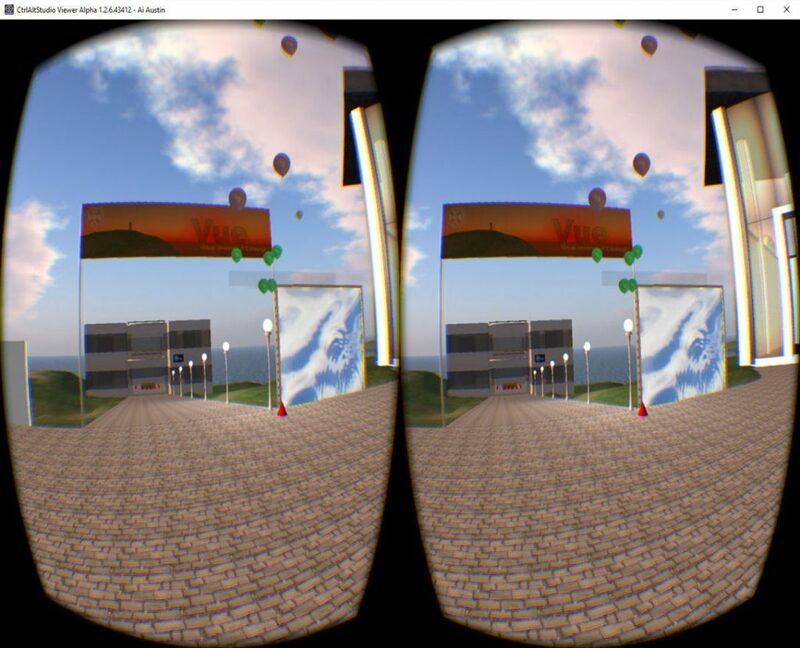 “Esc” also will return you from Riftlook/3D mode to the normal 2D view. It is recommended that you turn Antialiasing on: Preferences > Graphics > Hardware Settings. 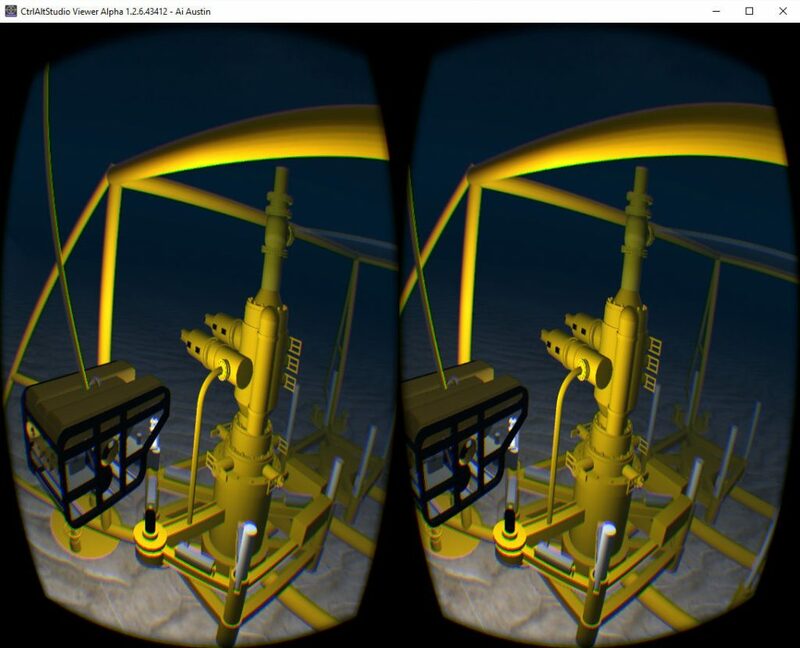 There are additional settings for the Rift Display for “FOV multiplier” and “Pixel density” display settings that let you tweak the displayed field of view and number of pixels rendered in the process of generating the Rift images. Depending on your graphics card capabilities, you may want to increase these for better visuals or decrease these for higher FPS. To improve your frame rate, reduce your draw distance and/or turn shadows off, etc. When using the (default)seated position, the left and right arrow keys usually turn your avatar. This can be set to turn or “strafe” in Preferences > Graphics > Display Output >. If you want to strafe instead of turn in seated operation, or turn instead of strafe if you have the “strafe” option selected, use Shift-Left and Shift-Right. The main viewer menu is not visible or accessible when in Riftlook/3D view. But, you can use keyboard shortcuts to show and hide various tools and dialog boxes such as the Conversations/Text Chat window (Ctrl-T) and Inventory (Ctrl-I), e.g., if you want to select a landmark to teleport to. 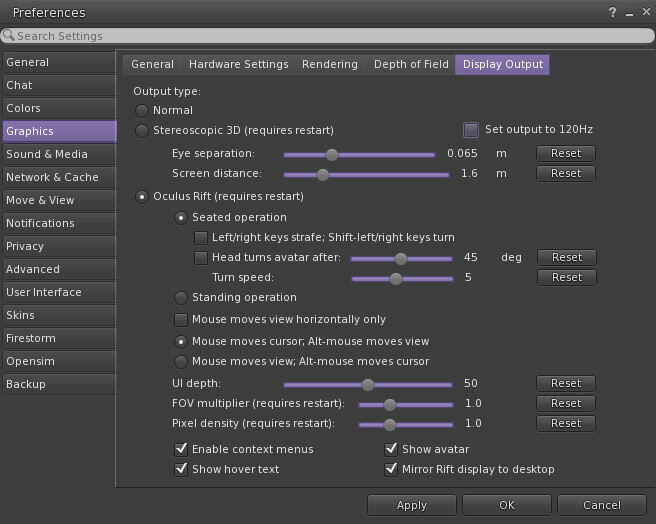 You can find the available keyboard shortcuts for such tools which are shown beside menu items when you are in the 2D view. In Riftlook/3D view, the mouse cursor shows as a cross hair visible in the left eye (see below for an explanation). If you hover the cross mouse cursor over an object and right click, the context menu for that item will be displayed and you can select menu entries… e.g. to sit on an object, to teleport, etc. If you are sitting on an object and therefore cannot conveniently see the “Stand” button in the User Interface, you can use the keyboard shortcut “Ctrl+Alt+S” to stand up. To display avatar chat in a possibly more useful format in the Rift — Preferences > Chat > General > Show chat in bubbles above avatars. You may also wish to tur on the indication that avatars are typing into text chat via Rift — Preferences > Chat > General > Show typing indicator in bubbles above avatars. 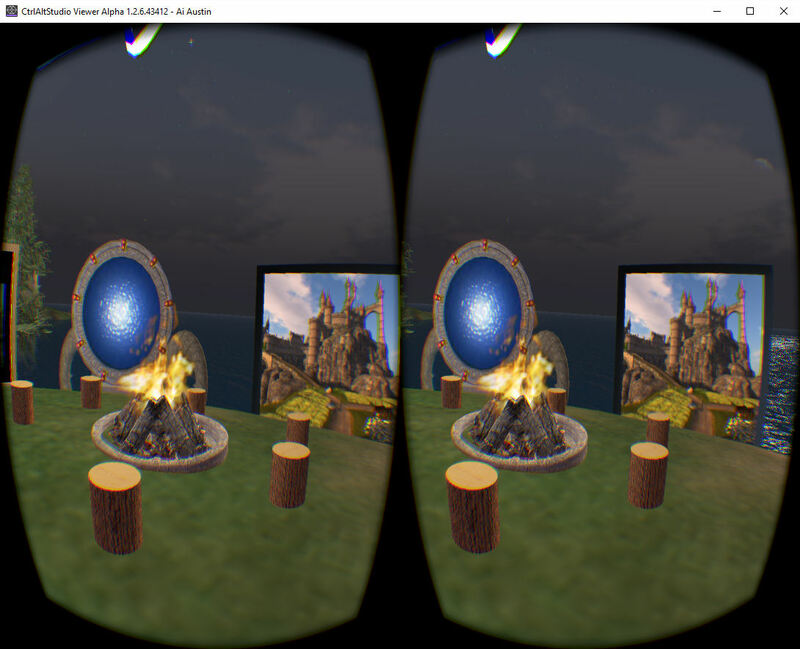 To get into 3rd person view when you are in Riftlook/3D view, press Alt and scroll out with your mousewheel. This is with the default settings. Depending on your “Mouse moves cursor/view” setting, you may just scroll out with your mousewheel and not need to press Alt. Adjust this behaviour via Preferences > Graphics > Display Output – radio buttons just above UI depth. 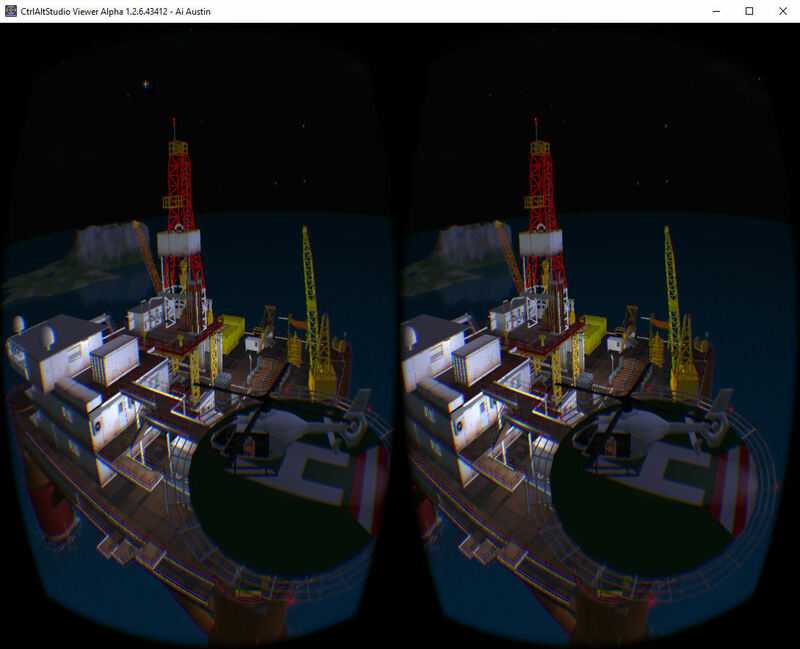 You can then orbit around objects or points with your mouse and Ctrl, Alt, and Shift keys as usual. Press Esc to get back into 1st person view. In 3rd person view while in Riftlook mode, the viewer menu shows, but it may be too far out of your field of view. 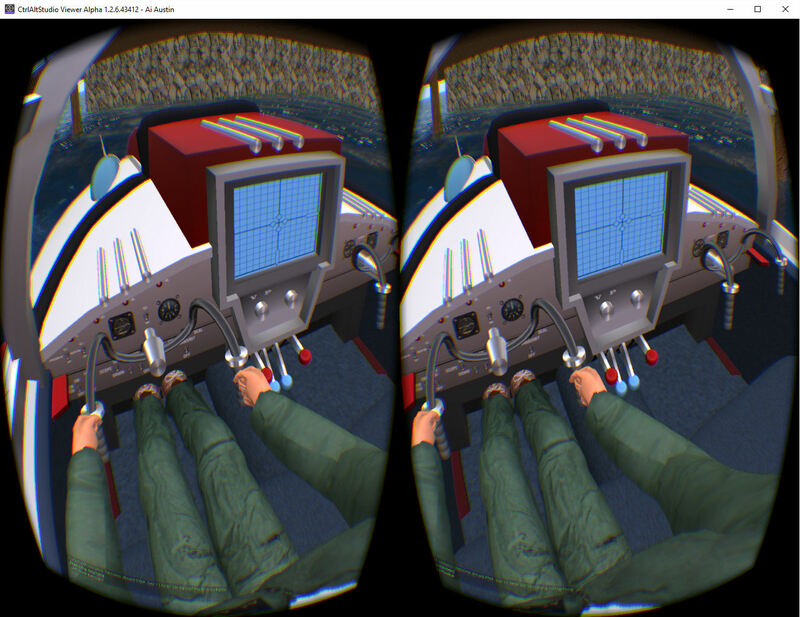 Interaction via the 2D on screen mirror may be possible to bring up menu selections, which will be visible in the Riftlook headset view. Riftlook 3rd person view mode is essentially like the normal viewer “Mouselook”. See http://wiki.phoenixviewer.com/fs_mouselook for more information on what can and can’t be done in this mode. Ctrl+Alt+F1 toggles the UI elements and menus off. If you find that the user interface elements in Riftlook/3D mode look out of focus try adjusting Preferences > Graphics > Display Output > UI depth. The cursor being visible in only the left eye is intentional behaviour. David Rowe reports that it is a “hack” that lets the cursor hover over UI elements and in-world objects correctly without needing complex code to sort out what depth to place the cursor in 3D space. David Rowe noted that the mouse cursor is okay over UI elements but a bit off horizontally over in-world objects. He did not have time to find a fix ahead of this release. I also observed that the mouse can be a bit off when using Alt + Left Mouse Click or Ctrl + Left Click in Riftlook 3rd person perspective to lock onto or rotate the view around in world objects. CtrlAltStudio supports wired and wireless versions of the X-Box Controller for Windows and X-Box One Controller (as bundled with the Oculus Rift CV1). It can also support other forms of “joystick”. 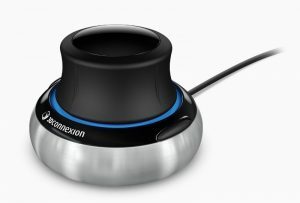 One I find particularly useful is the 3Dconnexion SpaceNavigator which is a “3D mouse” supporting both avatar motion and separate “FlyCam” camera control. My recommendation is to install the SpaceNavigator just by plugging it into Windows and receiving default Windows drivers for the device. 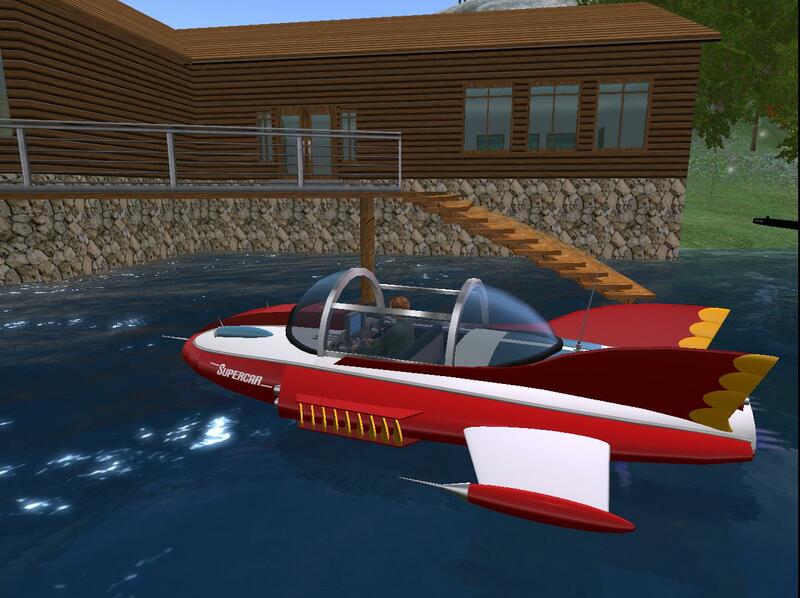 I do not install any special SpaceNavigator drivers as suggested on the Second Life Wiki, some of which are incompatible with Second Life viewers. 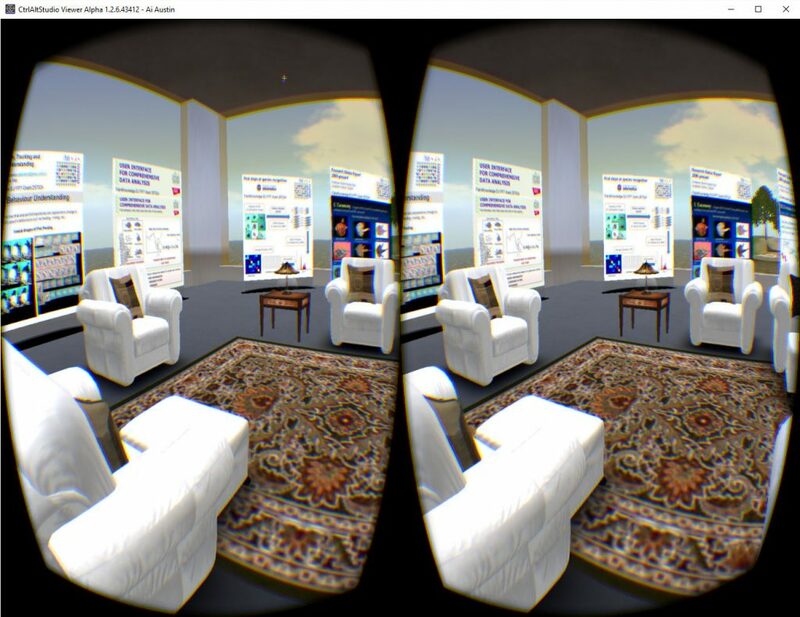 This entry was posted in 3D, Oculus, OpenSim, Second Life, VR and tagged CtrlAltStudio, Oculus, OpenSim, Rift, Second Life, VR, X-Box. Bookmark the permalink. Thank for this, I’ve linked to it in my overview of the 1.2.6.43412 release. The June 15th changes (TLS 1.2 enforcement) only affect cashier transactions via a web browser. So Firestorm 4.6.9 will not be able to complete cashier transactions when using the built-in web browser (e.g. trying to purchase from the Marketplace). 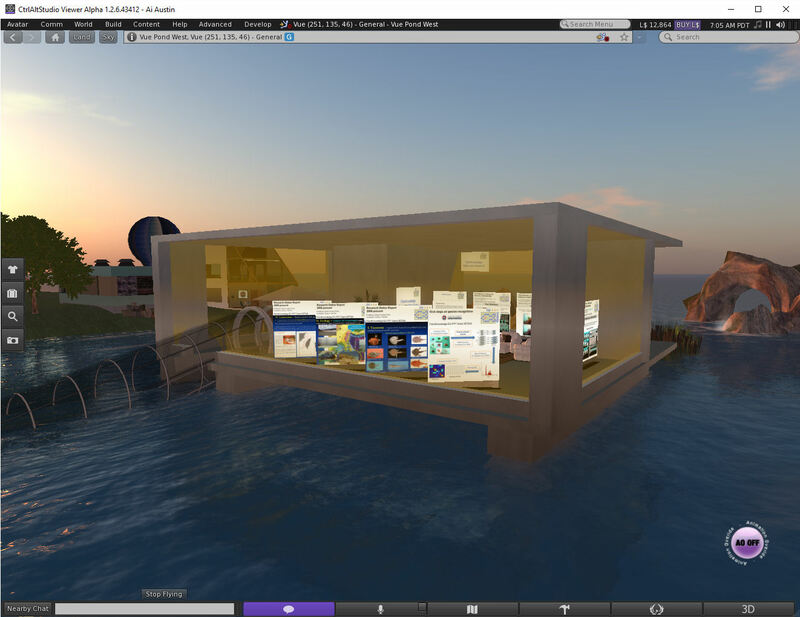 However, user / user transactions, transactions via in-world vendors and L$ purchases via the button in the top right corner of the viewer will still work with Firestorm 4.6.9. Great, thanks, I updated that comment accordingly.